Don't expect Bob Eaton to be grand marshal of any parades in Detroit, where the former Chrysler CEO's reputation took a big hit upon his early retirement in 2000 after helping to engineer the disastrous merger of unequals with Daimler-Benz. But Eaton is a hero at the University of Kansas, where he gave $5 million to the engineering school in 2003. And while he has been invisible in the auto world since leaving Chrysler, Eaton will return to his alma mater this month to be homecoming grand marshal and speak to engineering students. Eaton, 70, who earned a degree in mechanical engineering from Kansas in 1963, will ride in the homecoming parade and receive special recognition at halftime of the Oct. 23 football game against Texas A&M. He will speak to students, faculty, staff and special guests in Eaton Hall, the building his donation helped to complete. The knock on Eaton in Motown? Daimler dominated DaimlerChrysler, which Eaton had promised would be a "merger of equals." According to published reports analyzing Daimler's ill-fated acquisition, Eaton pocketed about $70 million from the deal. 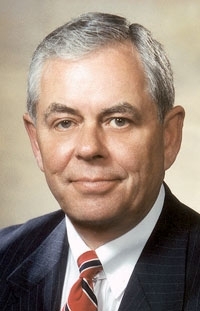 Eaton spent nearly 30 years with General Motors before he left his job as president of GM Europe in 1992 to head Chrysler, replacing Lee Iacocca. Eaton was hot stuff in the '90s but has been the target of a lot of venom since then. In his 2007 book, Where Have All the Leaders Gone? Iacocca wrote: "I'll always believe that if I hadn't chosen Bob Eaton to succeed me as chief executive at Chrysler, it would still be a strong, profitable, American car company."